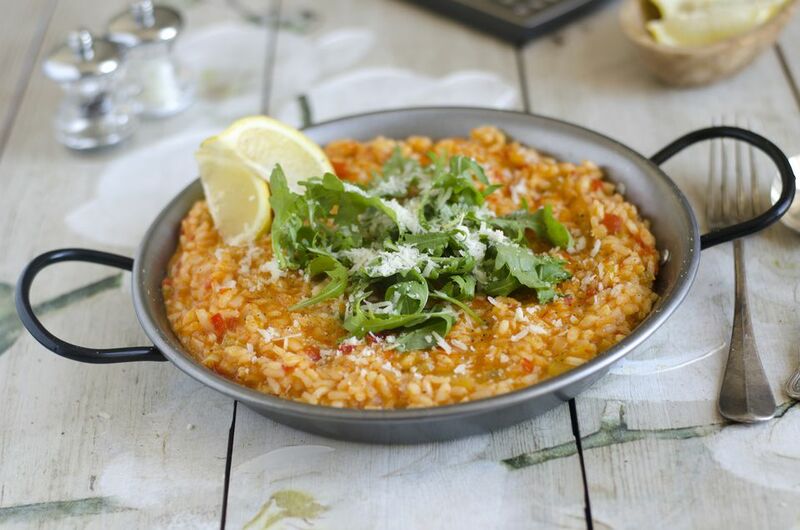 Risotto is a popular Italian rice dish that is deceptively easy to make. This low-fat vegetarian and vegan spicy risotto rice recipe uses cayenne and plenty of red pepper flakes to give it quite a bit of kick. It's a dish that is sure to be popular with whoever it's cooked for. This dish combines scallion and onion, red pepper, garlic, olive oil, cayenne pepper, and red pepper flakes, making it colorful and flavorful. The secret to getting the rich, creamy texture of risotto is patience. Be sure to slowly combine the rice with the liquid, allowing it to cook all the way out while stirring before adding more liquid. This can take around 25 minutes, but the resulting dish is well worth the wait! Sautee the onion, green onions, bell pepper and garlic in olive oil until soft, about 3 to 5 minutes. While vegetables are cooking, begin to heat vegetable broth over medium-low heat in a saucepan. Add rice to the pan with the vegetables and cook for one more minute. Add red pepper and cayenne, stirring briefly. Begin to add vegetable broth, 1/2 cup at a time. Stir, and wait until most of the liquid has been absorbed before adding more. Continue adding vegetable broth, and then the white wine 1/2 cup at a time. Sprinkle with Parmesan cheese or vegan cheese if desired. Serve hot with a side of crusty, Tuscan bread, a green salad, and a glass of white wine to temper the spiciness.